Your deck is an extension of the home’s interior. In fact, some of your best family time is spent out on the deck. We have one question, though – is this space safe for everyone, including kids and pets? It goes without saying that a small child should never be out on the deck alone. If you’re worried about your son or daughter getting outside without adult supervision, consider putting a lock up high so they can’t reach it. Be sure to check out the various lock options that match your decor. Deck surfaces can get dangerously hot in a hurry. That’s bad news if you have pets that spend lots of time outdoors. Protect Fido’s paws by using a retractable awning, umbrella, or tree to create shady areas. We’re willing to bet that your kiddo likes to explore. You would be surprised at how many children are injured in an attempt to climb up and out of a deck area. So remember to contain your child with some sort of gate. Container gardening is becoming more popular and for good reason. 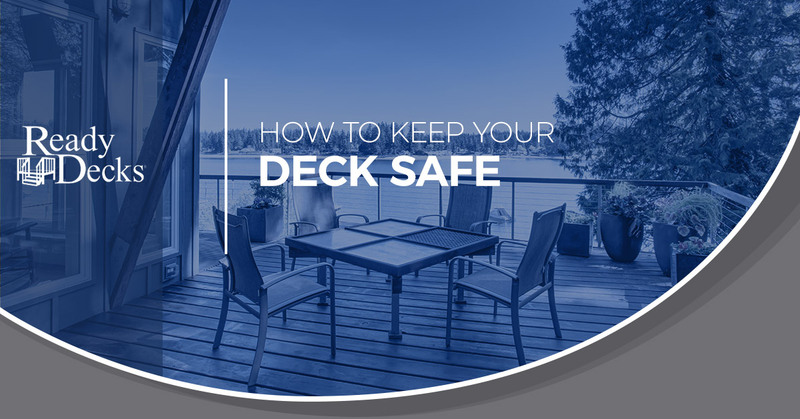 However, many deck owners don’t realize that their plants are dangerous to kids and pets. Do yourself and your entire family a favor and double-check the safety of plants before you make a purchase. Just because you might not have a backyard pool doesn’t mean you can overlook water safety. The reality is that anything more than two inches of water serves as a drowning hazard. Play it safe and keep your kiddo away from any sort of fountain or water feature. Nothing beats an afternoon of grilling out on the patio. Unfortunately, a hot grill has the potential to cause trouble for kids and pets. So keep your grill away from main traffic areas and, of course, supervise it at all times. It could be that you’ve either never had a deck or have put off repairs on your current one. Wouldn’t it be nice if you could have a pre-priced, beautiful deck installed in just one day? The local deck builder at Ready Decks makes it possible. The Ready Decks franchise was established nearly two decades ago. Our goal was to provide homeowners the highest quality site-built decks in the shortest time possible. That mission remains the same as we continue to emphasize quality, value, and integrity. When it comes to premade and prefab decks, the Ready Decks team has you covered. We also offer Ready Porches, gable porches, screen porches, pool decks, wheelchair ramps, carports, pergolas, and more. Just because it’s fall doesn’t mean you can’t think about outdoor leisure living options from Ready Decks. For the safest, most affordable decks, look no further than Ready Decks.